Essay by Julian.Small. Photographs by Sandy Kinghorn. The public buildings of the ancient Greeks and Romans were almost all designed using the five orders of architecture. Whilst the domestic architecture of the Greeks and to a lesser extent of the Romans, was quite plain and simple, their public architecture, whether temples, public baths, or basilicas, was in most cases very elaborate so as to impress the spectator with the importance of the building and the wealth of its builders. The orders were initially developed by the Greeks. The Greeks built few public buildings other than temples, and the basic form of a Greek temple, the main sanctuary or "Naos" surrounded on all four sides by a columned portico, is well-known to most people. The columns of the portico would all be of the same design, and would conform to one of three basic types, the Doric , the Ionic and the Corinthian . The Romans, in their temples and other public buildings, used all three of the Greek orders, together with two others of their own devising, the Tuscan and the Composite Orders. However, in each case, the term "Order" refers not just to the design of the column but also to the details of the upper parts of the facades carried by the columns. Each Order had its own conventions about the design of the "entablature", as the continuous horizontal band of stonework carried by the columns was called, just as much as about the design of the column. The entablature is itself divided into three sections: at the top is a projecting section called the Cornice, next comes a single deep horizontal band called the Frieze (which may be carved in some way or decorated with sculpture, or may be left plain), and then, between the base of the frieze and the column capitals, the Architrave, which consists of one or more horizontal bands, sometimes plain and sometimes carved. According to the rules of classical architecture, the entablature should always be divisible into these three zones of cornice, frieze and architrave. The Entablature is located above the pilaster capitals and is divided into the three zones of Cornice, Frieze and Architrave. 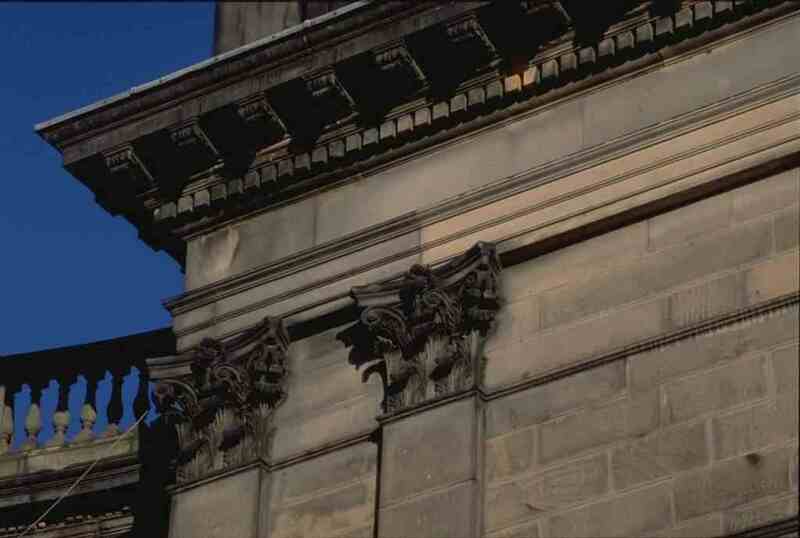 The Frieze is the deep plain band in the centre, with the Architrave below, and the Cornice projecting above. The most complete architectural textbook to have survived from classical times is the one written by Marcus Vitruvius Pollio, better known just as Vitruvius, a minor architect of the first century BC, who was employed by Julius Caesar, and in his old age wrote a treatise of "The Ten Books On Architecture," which he dedicated to the emperor Augustus. This describes the use of the various orders, and shows how the term "order" covers more than just the style of the column. During the Middle Ages, this book was known, and at times buildings were constructed trying to imitate ancient Roman models, but Vitruvius' rules were never followed consistently. Such imitation tended to be piecemeal with, in one building, column capitals carved to imitate Corinthian capitals, in another the columns fluted in imitation of ancient ones, and in a third the column bases carved in the same form as Roman bases. Nowhere were Vitruvius' rules followed consistently, and it was not until the Renaissance and the reawakening of interest in classical antiquity in early-fifteenth century Italy, particularly in Florence under Brunelleschi, that there was any attempt to follow the rules of classical architecture consistently, in particular to try to use the different orders, including the entablature, correctly. The ancient Greeks designed their temples, as has been said, with colonnaded porticoes surrounding a central naos or sanctuary. The spaces between the columns of the porticoes were always bridged by flat lintels, forming the base of the architrave. For the colonnades around their temples, the Romans used similar constructional techniques, but they also invented the arch, which is a much stronger form of construction than the lintel. An arch is formed of wedge-shaped stones called voussoirs, bridging a gap by means of a semi-circle or part-circle. This throws the weight of the masonry above it to either side, on to the columns, and gives a much more stable construction than using a lintel, which can break from the weight of masonry above. The Romans frequently combined the use of the orders with the arch.